Facebook: Latest MyGica affordable remote/keyboard/Air Mouse for computers, Facebook, TV boxes, everything. Item 874e: $26.95Can or $20.26us Brand New. making sure your 2x AAA batteries are in - and you're ready to go! 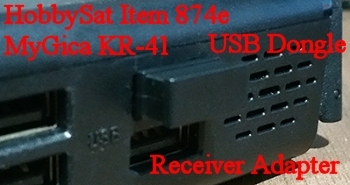 With the KR41 Keyboard remote you are able to fully control and turn on/off any MyGica Android box using its IR sensor. you can enjoy being comfortable. The MyGica KR-41 Wireless Remote and Keyboard is now sweeping the streets ready to dazzle! 1. Unhook your USB dongle from the MyGica Box. 2. Hold down Vol+ And Page+. 3. Hook up the USB Dongle to your MyGica Box. 4. Keep holding the buttons till the Flashing blue on your remote Stops. That is all. Now you have successfully paired your KR41! the FN button, then press the yellow colour button. • Operation Range: up to 10 metres or more. See the first picture on this page for a view of the buttons/functions of the remote. I love this remote. It is the best one I have bought so far. It is nicely priced. Feels good in my hand. Just better than all the other remotes I have used. Paul Chester: February 25, 2017 Halifax, N.S. 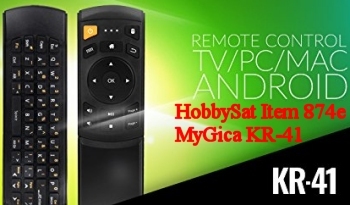 Easily navigate through XBMC or KODI with MyGica KR-41.